This post was written as part of Oriental Trading’s Brand Ambassador program. Products for the candy buffet were provided by Oriental Trading for the purpose of this post. All opinions are mine alone. A candy buffet, also referred to as a candy bar, is a great addition to any party or event. Candy buffets are perfect for weddings, baby showers, bridal showers, graduation parties, and birthday parties. Candy buffets are the perfect addition to your event because they serve multiple purposes. They are decorative and colorful and work as party decor. 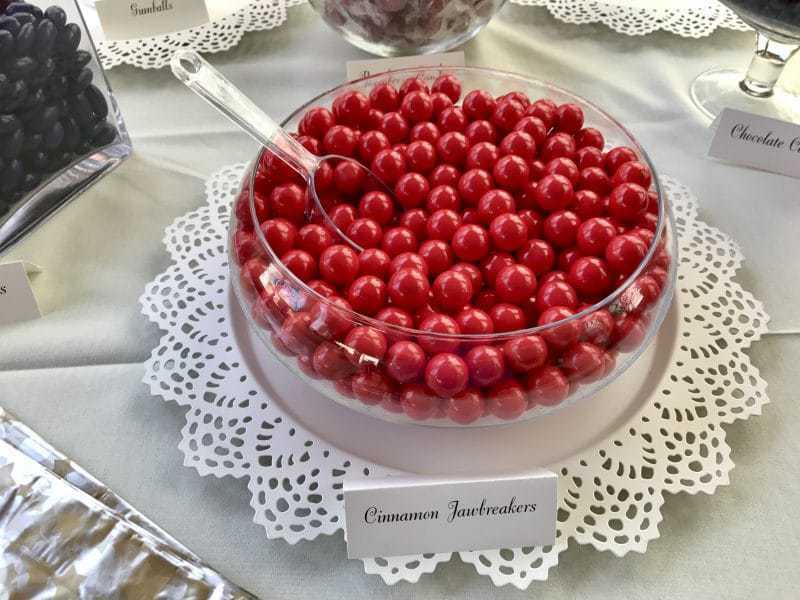 The candy being offered serves as a dessert or treat for your guests to enjoy while at the party. Plus, if you include baggies or boxes for guests to fill and take with them, the candy buffet can also serve as a party favor for your guests. 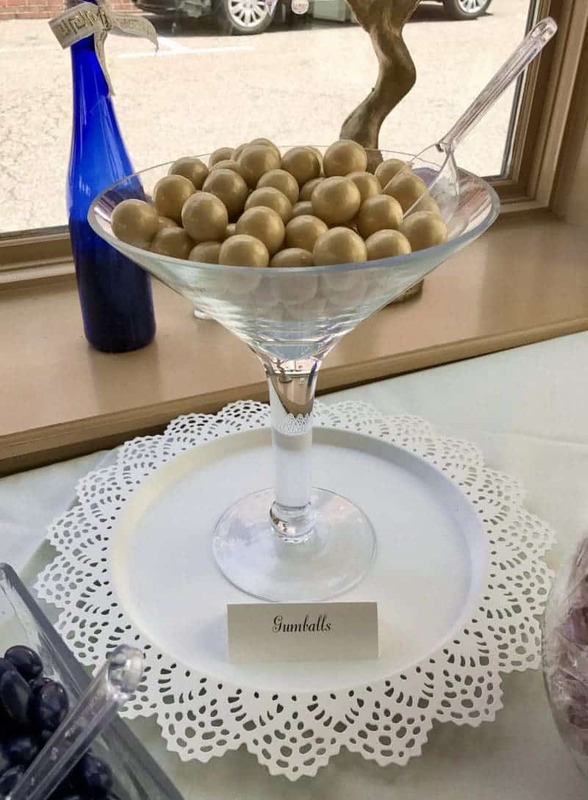 If you decide to set up a candy buffet for your next event, you may be wondering what supplies you will need and where to get the candy for your candy buffet. Let's take a look at everything you will need to set up the ultimate candy buffet. Obviously you will have no candy buffet without the candy. When selecting which candies to order, I recommend working with a color theme. 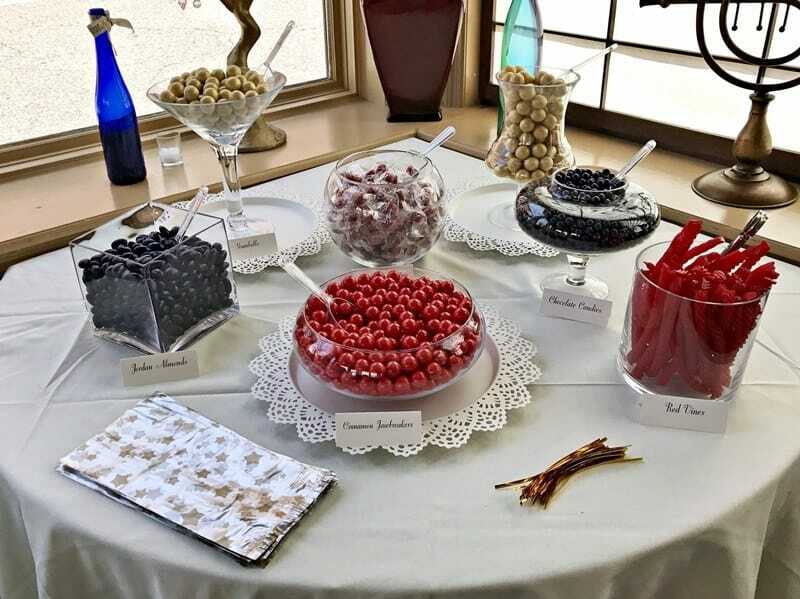 For example, for the recent candy buffet I set up for my friends bridal shower I selected candy to match her wedding colors: burgundy, navy, and gold. Also, it is a good idea to keep in mind the types of candy you will be purchasing, so that you can get good mix of different kinds of candy. You wouldn't want to end up with a candy buffet that just included 5 different colored gumballs, right?! I didn't think so! Your guests will appreciate a wide selection of goodies to choose from. For the candy buffet I set up, I included gumballs, chocolate candies, licorice, hard candies, candy coated almonds, and jawbreakers. I thought that was a pretty good variety, and the guests seemed to enjoy it. Ordering candy in bulk is much more convenient and cost efficient than shopping in a candy store. You will find 100+ types of bulk candy available to order at Marry Me, one of my favorite wedding supplies websites. You will find a wide variety of different shaped clear jars, bowls, and glasses to display your candies in. I like to use a mix of different shaped jars and bowls to bring more visual interest to the candy display. You can opt for plastic candy containers or glass candy containers. Glass looks the best, and can be a good choice for an adults-only party. If you are having an event that children will be at, I suggest plastic containers because they aren't as fragile as glass. Plus, plastic candy jars are typically cheaper, which means you have more money to spend on candy! 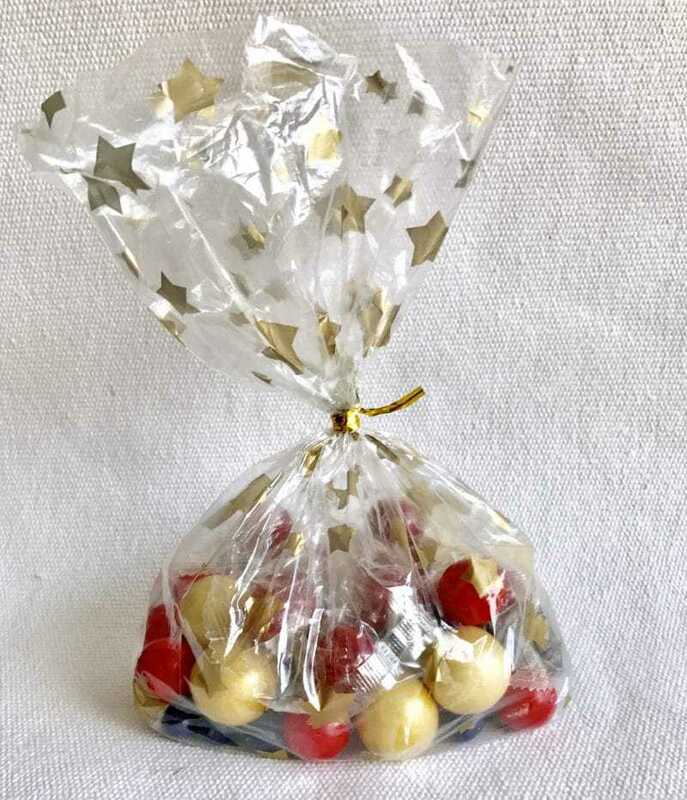 You will want to offer your guests favor bags or small favor boxes to fill with the candy in your candy buffet. Get a bag or box that matches your color theme, or opt for a plain clear cellophane bag. They even offer personalized baggies that you could get for the event. Also, be sure to have twist ties or ribbon available so that your guests can secure the bag if they want to take their candy home with them. I don't know about you, but if I saw a candy buffet with people just digging their hands into the jars to get their candy I would stay far away from that candy! So, be sure to put out candy scoops that your guests can use to pour their candy into their bag / box. You can either place a scoop directly into each jar or you can place one or two scoops out on a plate and your guest can use the same scoop for multiple jars of candy. I find it is easier for the guests if you place a scoop into each jar, that way multiple people can be getting candy at the same time. If you include candy such as licorice sticks you may want to have tongs out for guests to use to get the licorice. Scoops don't work well on long items like licorice sticks. There is nothing worse than thinking you are popping a gumball into your mouth and biting down on a hard cinnamon jawbreaker! This is why I like to include labels or signs in front of each jar of candy so that the guests know what kind of candy is in the jar. Plus, not everyone likes every kind of candy, and some people may even have allergies to certain items offered in your candy buffet (especially if you are offering candy with nuts in it). Do your guest a favor and label those candies. I hope that these candy buffet ideas help you plan for your candy buffet. If you are sure to have all the items I recommend, I am sure that your candy buffet will be a total success! Candy buffets are so fun. Plus they can be really fun for a birthday party, wedding or a baby shower. This is so good to know! I’ve often wanted to set up a candy buffet for my kids’ parties but wasn’t sure where to source the candies. I’m wary of ordering them online because I want to know they’re good quality. I’ll definitely look here for our next party! what a fabulous idea! I’m definitely going to consider doing one of these for my daughter’s upcoming birthday party! !